Here is a fun fingerplay that you can enjoy again and again with your child and children as you adjust to the cooler weather, spend more time inside and celebrate the fall season together! Fingerplays support your child’s development in so many ways. They encourage your child to listen and to speak, to co-ordinate hand and finger movements that accompany the words, to use their imagination, to practice counting and to hear the musical quality of spoken words. They play an important part of your children’s fine motor skills development which is the precurser to learning to draw, write and work with their hands. 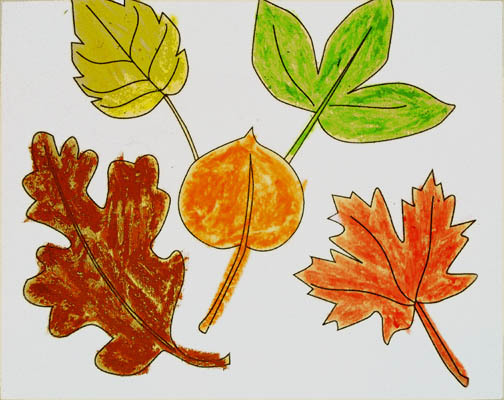 When you have found leaf images you like, encourage your child to colour them, then help with cutting them out. Set the leaves aside, then cut out five strips of construction paper, just long enough to wrap around your fingers, like rings. Tape the ends together. Now you can attach the leaves to the rings using paper clips. 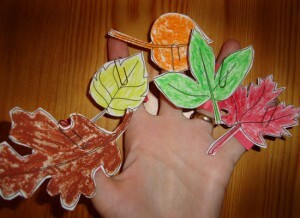 Put the leaf rings on your fingers and then you are ready to recite this simple rhyme that the little ones adore. With each repetition you can easily remove one leaf at a time by sliding off the paper clip. The leaf cut outs can be used to help your child understand number concepts such as counting and subtracting in a creative way. Repeat this rhyme, subtracting one leaf each time until no little leaves remain. For more information on the importance of art in children’s education, or for educators, parents and care providers who are looking for creative ideas to share with young children, please feel welcome to participate in helping to create a community of teachers and learners who enrich the lives of young children through the arts at the Early Childhood Arts Connection.